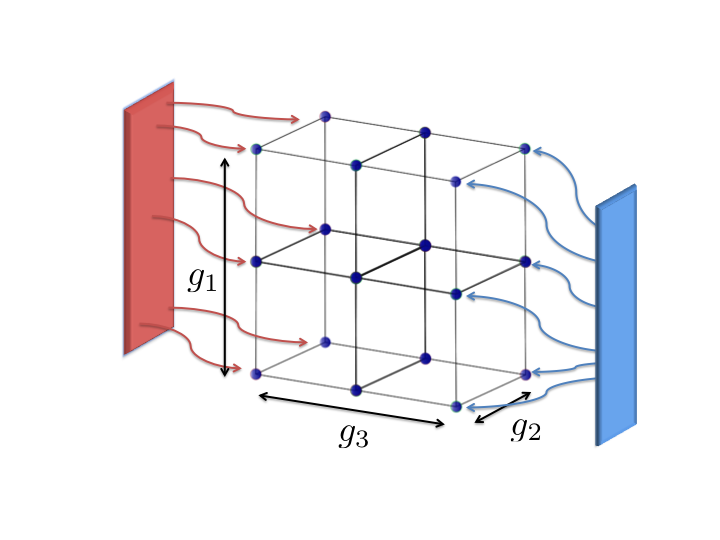 Quantum transport in lattices is a major field of study nowadays. It has been probed that a lattice composed by harmonic oscillators connected to two thermal baths at different temperatures behaves ballistically in any dimension . On the other hand, if the lattice is composed by spins it is ballistic only in the one-dimensional case [2, 3]. In the simplest two-dimensional spin lattice, a ladder, it has been numerically probed the existence of both ballistic and non-ballistic channels . In this talk, I will show that both fermionic and bosonic uniform d-dimensional lattices can be reduced to a set of independent one-dimensional chains . This reduction leads to the expression for ballistic energy fluxes in uniform fermionic and bosonic lattices. By the use of the Jordan-Wigner transformation, we can extend our analysis to spin lattices, proving the coexistence of both ballistic and non-ballistic subspaces in any dimension and for any system size. We then relate the nature of transport to the number of excitations in the homogeneous spin lattice, indicating that a single excitation always propagates ballistically and that the non-ballistic behaviour of uniform spin lattices is a consequence of the interaction between different excitations. M. Znidaric. Phys. Rev. E 83, 011108 (2011). D. Manzano, M. Tiersch, A. Asadian, and H.J. Briegel. Phys. Rev. E 86, 061118 (2012). M. Znidaric. Phys. Rev. Lett. 110, 070602 (2013). D. Manzano, C. Chuang, and J. Cao. New J. Phys. 18, 043044 (2016). Evolution in host-pathogen systems: emergent trade-offs and self-evolved criticality. Los seminarios se encuentran financiados por el Ministerio de Ciencia, Innovación y Universidades. © 2019 Seminarios internos del Grupo de Física Estadística y Sistemas Complejos. All rights reserved.